Reverent Father Lysol Tony-Romeo and the First Church of the Sacred Silversexual, San Francisco's 7th Annual Bowie Birthday Bash! It has been 2 years since His Bowieness forever abandoned corporeal form and became Pure Stardust. We honor his Legacy with a full weekend of Bowie Worship! Front to back! Cover to cover, you might say. Plus a special encore set and midnight mass! But that's not all! 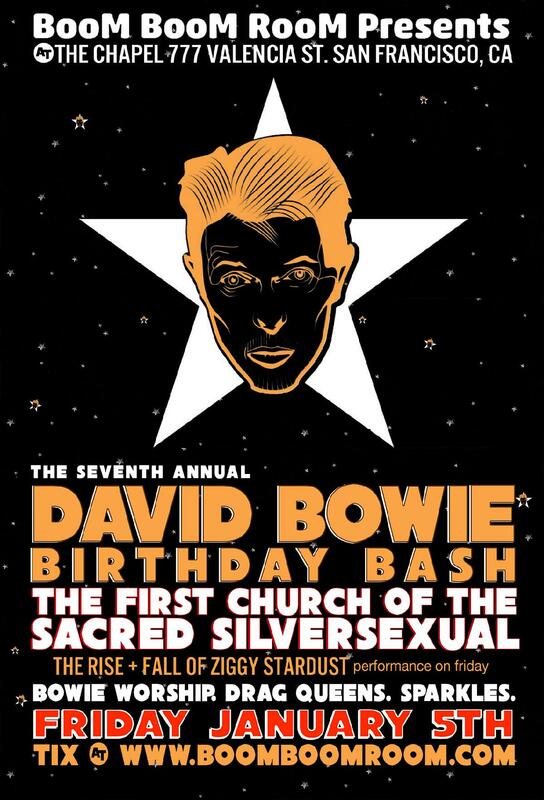 A proper religious tribute to Bowie wouldn't be complete without a Big Spectacular Stage Show, and we've got that and more! We will be welcoming some of SF's favorite drag queens and burlesque stars to the stage as the Spirit of Ziggy flows throughout the performance! Plus a limited number of 2-night passes for $50!